Etymology: the name Albizia comes from its "inventor", the Florentine nobleman, Albizi, who brought it back in Europe in the XVIIIth century. The nickname "tree with bristle" alluded to its feathery flowers. Origin: China, Japan, Korea, from where it was introduced first in Iran (" julibrissin "). 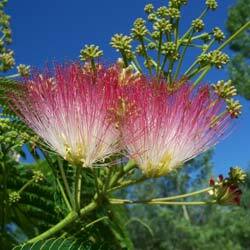 Hardiness: zone 7 (Silk Tree supports cold until -17 ° or 1 °F). Height: 12 m tall. Slow growth (25 cm / year) in regions traditionally qualified for France, "north of the Loire" (less hot and shorter days than in the South of France). Deciduous leaves resembling the fern. 30 cm long. It is sensitive: it folds inward in the evening, also when touched, re-opening minutes later, or if it is cut. Flowers with long silky, pink stamens, grouped as pompoms, in July-August. Fruit: pod, flat, of 10-15 cm, containing 5 - 8 seeds which spread when the pod opens by itself. Uses: the wood of Silk Tree is yellow. It serves in cabinetmaking and for wood engraving. 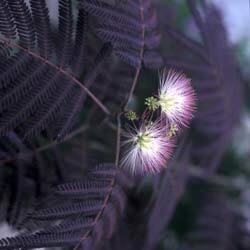 Silk Tree is a nice ornamental tree, somewhat bulky.